Online sales close at 6pm on the day of the event. Tickets may still be available at the door when the box office opens, 10 minutes prior to show time. This show contains adult content and is intended for ages 17+. 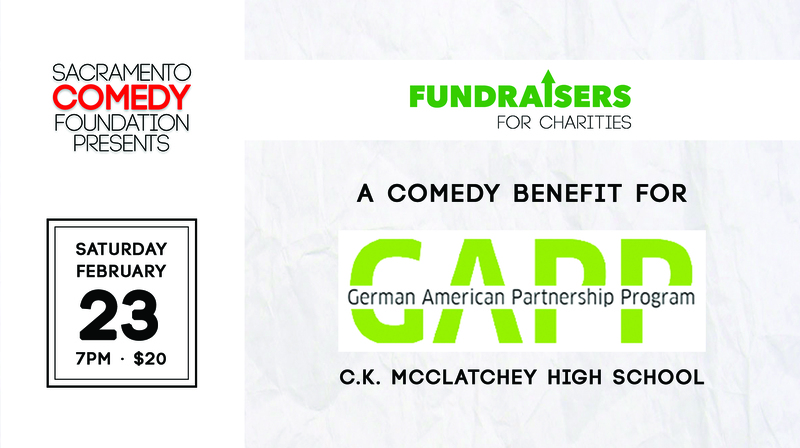 Sacramento Comedy Foundation presents a comedy show to benefit the German American Partnership Program (GAPP) of C.K. McClatchey High School! Every two years, C.K. McClatchy participates in a GAPP exchange trip to Germany. Our next trip will be in June 2019. In addition to language studies, the program aims to raise funds to sponsor students from Germany to attend school at C.K. McClatchey in a cultural exchange. CKM students also choose to study abroad to learn more about the world and other cultures firsthand. Click HERE to learn more about the C.K. McClatchey program. Click HERE to learn more about GAPP.